Enjoying a sukkah during the 2012 Sukkah Bike Hop. In light of the flooding that has had such a profound impact in our community, Chabad of NW Metro Denver and Hazon look forward more than ever to offering the Sukkah Bike Hop this Sunday for those looking for an opportunity to spend time in the outdoors in community. Sensing there are many who may just be looking for an opportunity to relax, we have added a free “Sukkah only” option. If cycling isn’t your thing, we hope you’ll join the riders at the conclusion of the ride for good food, good company and relaxing. Due to dangerous road conditions in Boulder County, the ride will now begin and end in Westminster. On Sunday, September 22, the ride will begin and end in Westminster, at Chabad of NW Metro Denver, and there will be a long (60 mile) route, as well as a shorter (20 mile) route, allowing cyclists a suitable choice. (Due to shifting road conditions, the final route details will be available on the morning of the ride.) Riders are invited to come at 8:00 am for caffeine and light breakfast nosh and to ensure their tires are inflated and seats properly positioned. The riders will head out promptly at 9:00 am. For those who wish to skip the cycling and just chill in the sukkah, you are welcome to drop by anywhere between 12:30 -2:00, though we do ask that you register in advance. Come and reflect on the holiday, eat delicious, freshly-prepared, kosher foods and enjoy the company of fellow riders. Chabad of NW Metro Denver and Hazon are thrilled to again offer this event, helping make our community healthier and more sustainable, while celebrating Jewish life, holidays, and our community. 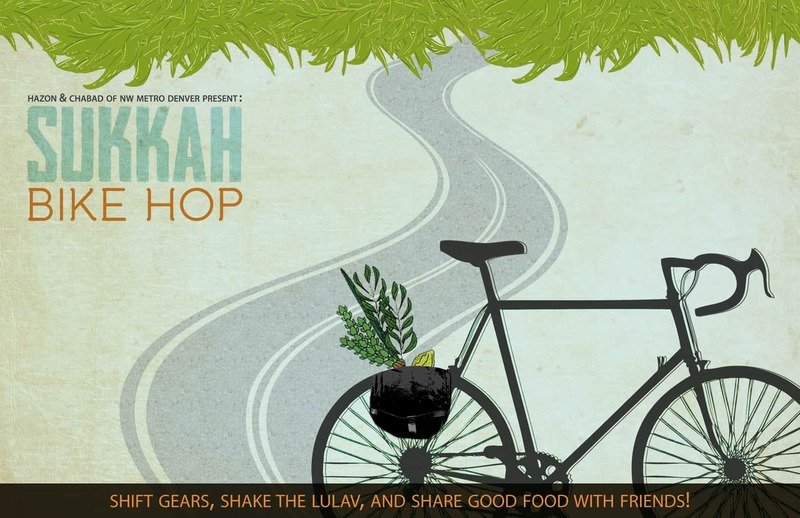 To register for the ride or the “Sukkah only” option and for more information, simply visit www.sukkahbikehop.org. Registration is now open. Advanced registration is strongly encouraged! Beat the $10 late registration fee by signing up by Thursday, September 19. Click here to see the fun from last year’s ride.